: to go or to cause (something) to go from one person or thing to another. This booklet is based on an exhibition developed by the South African History Archive (SAHA) using materials from the Shifty Records Collection (AL3296), as part of the Shifty September programme of events, celebrating 30 years of seditious sounds from Shifty Records, for Heritage Month 2014. 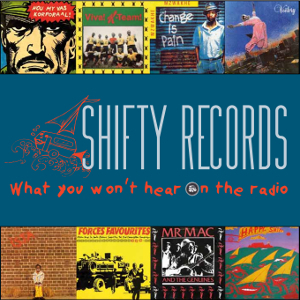 Founded by frustrated musicians Lloyd Ross and Ivan Kadey in the dark beginnings of the turbulent 1980s, Shifty Records was a fiercely independent maverick label intent on recording original South African music – sounds that spoke about what was actually going on in the country, songs that the government of the time more often than not did not want to be heard. 2) Does it have quality? 3) Does it occupy a time and a place in this country's musical development? By sticking to these rules, Shifty produced almost all the seminal “alternative” music of the time. Thanks to Business and Arts South Africa for funding the production of this booklet, and to the Alliance Française of Johannesburg, the Atlantic Philanthropies, the National Arts Council, the SAMRO Foundation and Spier for their generous support of the Shifty September programme of events.